INC and DEC Instructions, Cont. If there are two operands, only one operand can be a memory operand. Processor status is described as condition codes, or status flags. 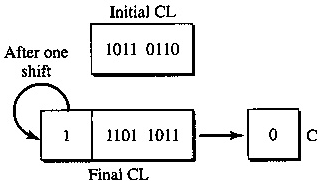 Condition codes refer to the information about most recently executed instruction. For example, if decrementing a register produces zero value, the zero flag ZF is set by the processor. Each flag is a single bit in the flag register, EFLAGS. If last addition or subtraction produced a negative result, the sign flag SF is set. 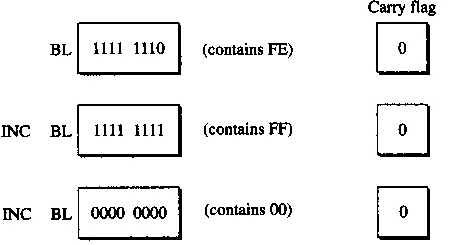 The result is -3, represented internally as 0FDh (binary 11111101). Arithmetic operations have a potential to run into a condition known as overflow. Overflow occurs with respect to the size of the data type that must accommodate the result. to fit in the original data type. both operands are negative and the result is positive. there is a carry out of the leftmost (most significant) bit. Computers don't know the difference between signed and unsigned binary numbers. This is a good thing, because it makes logic circuits fast. This is also a bad thing, because distinguishing between signed and unsigned becomes programmer's responsibility. Distinction between signed and unsigned data types is very important when detecting an overflow after addition or subtraction. Overflow when adding signed numbers is indicated by the overflow flag, OF. Overflow when adding unsigned numbers is indicated by the carry flag, CF. The destination operand can be a register or a memory location. This instruction allows a loop counter to be updated without disturbing the CF flag. while preserving the state of the CF flag. 8. INC and DEC Instructions, Cont. Especially useful for incrementing and decrementing counters. A register is the best place to keep a counter. never update the carry flag CF, which would otherwise (i.e. ADD and SUB) be updated for carries and borrows. The instructions affect the OF, SF, ZF, AF, and PF flags just like addition and subtraction of one. xor al, al   ; Sets AL = 0. XOR instruction always clears OF and CF flags. inc bl       ; 0FFh SF = 1, CF flag not affected. inc bl       ; 000h SF = 0, ZF = 1, CF flag not affected. CMC complements Carry Flag, CF = NOT( CF ). the sum of two positive signed operands exceeds 127.
the difference of two negative operands is less than -128. (CF) carry flag indicates that the sum of two unsigned operands exceeded 255. (SF) sign flag indicates that result goes below 0. LAHF instruction loads lower byte of the EFLAGS register into AH register. The NEG instruction negates a value by finding 2's complement of its single operand. This simply means multiply operand by -1. When a positive value is negated the result is negative. A negative value will become positive. where 1 <= count <= 31. All bits in the destination operand are shifted left count times. The less-significant bit (LSB) is filled with 0 each time. The most-significant bit (MSB) is placed into carry flag CF. Other flags are modified according to the final result. SHL is very useful for computing powers of 2 and multiplication by 2, since each time binary number is shifted left, its numeric value doubles. SHR does the opposite of SHL. Zeroes are shifted in from the left, right bits moved to CF. Same as SHR, except that most-significant bit (MSB) is shifted back to itself. This preserves the original sign of the destination operand, because MSB is the sign bit. 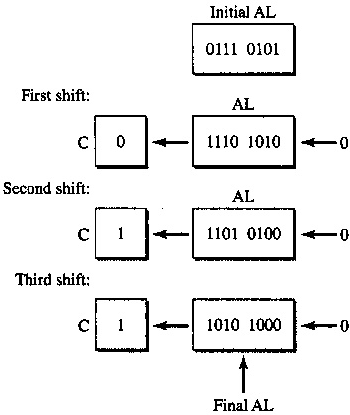 Each shift divides the destination operand by 2, while preserving the sign. Note that LSB is shifted into the carry flag CF.